One of the best and simplest things I've ever done is make my own vanilla extract. I used to buy it at Trader Joe's and really liked what it did for our ice cream, so that's the kind I wanted to make. Using homemade vanilla extract, our raw Jersey ice cream (and many other dishes) are out of this world. Like 500 times better. Perhaps that is an exaggeration. But the point is, homemade vanilla offers much more flavor. Here's an example of what it can do. I had some frozen Jersey cream (a bit freezer burned), back in May, I think. I made ice cream, using vanilla extract from Trader Joe's. Nobody liked it, no doubt because of the freezer burn. What's wrong with the ice cream, Mom? I had more frozen cream (a bit freezer burned). I made ice cream in late July, using my bourbon vanilla extract. The ice cream was amazing. Mom, what did you do to the ice cream? Its soooooo good. Did you get fresh cream? See what I mean? The awesome, homemade bourbon vanilla extract was so good, it masked mild freezer burn. Here's how to make it. It couldn't be simpler. I used this recipe to guide me in making up 1/2 gallon. One of the best and simplest things I’ve ever done is make my own vanilla extract. And bourbon vanilla, at that. Adapted from this recipe. Split the vanilla beans in half, lengthwise. Put the seeds and beans in a clean 1/2 gallon jar and pour in vodka or bourbon. Cover the jar, then shake it gently. Put the jar in a dark cupboard. Shake it up every few days. Start using it after a few weeks, though after 8 weeks it will be good and dark. Use anywhere you would use normal vanilla extract. Continue adding vanilla beans and vodka bourbon for an endless supply of vanilla -- 4 vanilla beans for every cup of bourbon. But Vanilla Beans Are So Expensive! Because people often balk at the price of vanilla beans, I want to mention that even though they are so expensive, you can save quite a bit by making extract yourself as I show you here. Yes, vanilla beans are expensive. But 32 of them and a 1/2 gallon of vodka or bourbon is still less when you consider you can pay up to $20 over and over again for tiny little bottles of organic vanilla extract. So the math DOES add up even if you have to make an initial investment in the vanilla beans! 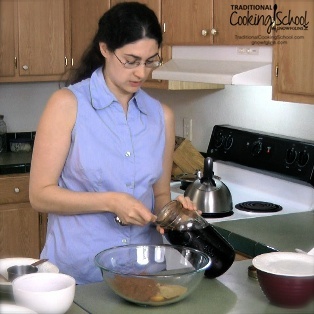 Below, I'm adding bourbon vanilla to sourdough chocolate cake in this week's new video for the Sourdough eCourse. Mmm.. See how dark it is? That vanilla is about 9 weeks old. This would make wonderful gifts, wouldn't it — small, pretty glass jars for all your lovely people? 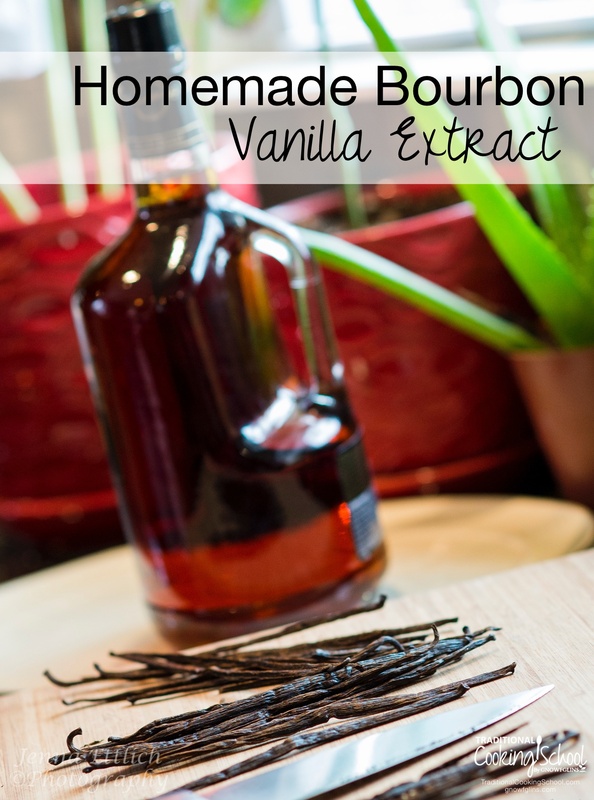 Have you made homemade vanilla extract? What did you think? can you mix the vanilla paste made with bourbon to a vodka based vanilla batch?? Do you use the oz or 4oz. size of vanilla beans from Mountain Rose Herbs? Erin, I bought an 8 ounce package, with more than 64 vanilla beans. That’s enough to make 2 1/2-gallons of vanilla. So I think a 4 ounce size would work for you. Thanks for sharing. I’m excited to try this. After watching you use your vanilla in the sourdough chocolate cake ecourse it had me wanting to try it. Now I’ll be able to try it. Wardee you are a blessing. Wardee, I’m so glad you posted this! I was telling DH about this and he asked what type of bourbon? He wondered if Jack Daniels would be ok. What type/ brand did you use? I was just thinking some cheap stuff, but if it makes a difference then I’ll get something better. Tara — I bought one of the cheapest. Really, this could probably use some research. I looked at the ingredients for the most expensive to the cheapest and I think they were all the same. So, I bought the cheapest. There might be more to it — if you find anything out, let me know! It’s worthwhile considering buying corn free vodka. This is such a fantastic idea. It would be great for inexpensive Xmas presents. I <3 MRH and they have a bunch of small pretty bottles that would be wonderful for this. I knew I was going to win! I have never won a blog give-away, but we are going camping this week, and I just knew. Thank you and thank you Katie! I am very new to camping, but my husband and my children absolutely love camping, so there is a lot for me to learn. And they eat out of cans and boxes the whole time, so maybe I can sneak in some real food slowly but surely. I just wish I had spelled my name correctly, so that when it was mentioned in your blog it would be right! I would like to try making vanilla. I am going to put it on my list of things to do. Kelli – I can fix that! I wondered about the spelling but just went with how you did it. 🙂 Enjoy! I have been trying this for a number of months with vodka, since it is nearly flavorless, but I haven’t got it to taste good yet. Now I see I probably need more beans to liquid volume. And maybe the bourbon adds better flavor too. I’m excited to keep trying. I’ve used vodka as well as rum when making vanilla. The vodka has no flavor so flavor is reliant the beans. Rum, depending on brand has minimal flavor but is a little better than vodka. Any bourbon, depending on brand, makes it more of a maple syrup flavor. When ever I bake I usually use the one with rum but I’ve never seen any of my gifts re-gifted. 🙂 you can also run the cheaper brands thru a water filtration system, brita, and improve the flavor of the alcohol. I made bourbon vanilla back at X-Mas time and just took the cap off of one of the bottles. I was knocked over by the bourbon smell and there was no vanilla smell what so ever. I used two organic beans to 8 oz of bourbon per the recipe I had. Maybe too few beans. I’ve seen recipes that said 7 beans per cup. Just made some using 7. That’s a lot of vanilla extract!! Would it be safe to say that you could 1/2 or even 1/4 the recipe successfully? Jen — Definitely! The original guide I followed said to combine 1/2 cup of bourbon with 2 vanilla beans. I scaled up for the 1/2 gallon of bourbon I purchased. I do use alot of it — every two days I use 1/2 cup for water kefir cream soda. I love cream soda! Can you share your recipe for the kefir cream soda please? Thanks! My sil, who is also a gnowfglins ecourse member…I haven’t figured out her username yet (that’s something I’ve been meaning to ask her) Anyway, she was just talking about this and thinking on using the vodka because it apparently can be made from grapes or potatoes or grain and she is looking for something totally gluten free. We were both wondering about bourbon and how it is made. If anyone has any more info on that please post! We’d be interested in it. This does look really amazing. I’d love to try it soon. Thanks for looking that up, velcromom. 😀 I’d say the issue is that this is GMO corn. Ick. If anyone runs across non-GMO corn bourbon, let us all know! I am interesting in the process of having an on-going supply. You say you just continue adding bourban and vanilla beans, do you ever at any stage remove the old ones? Kylie — I don’t think you need to, but probably at some point they will take over. I haven’t gotten that far yet, but when I do, I’ll just scoop out the old ones. Toni — That’s interesting about vodka v. bourbon. I’m glad to know that and I’m sure others who are gluten-free will appreciate that you posted it. Thanks! Karen — I haven’t seen their bottles, but thanks for mentioning it! Next time I order, I’ll take a peek! I’ve done this w/ vanilla beans and vodka. 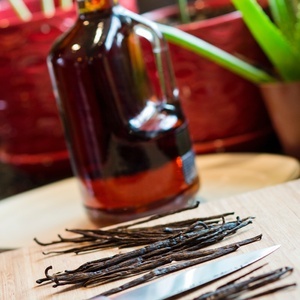 The bourbon vanilla extract you buy is generally called “bourbon” because of the type of vanilla bean. You can use bourbon for the extract, but it’s not necessary. I bought my vanilla beans on ebay when I did this. You can sometimes find great deals. I also got “grade b” beans which are smaller – but are fine for this purpose. If you want to find bottles w/o paying a lot for shipping (to make small gifts) – try pharmacies or medical supply stores. You can sometimes get the dark bottles that get used for liquid medicines. One other tip I heard was to take the beans out when you are finished w/the extract and after they are dry – put them in a container of sugar. Let it sit for a while – and you will get vanilla sugar. Not sure I will do that as I don’t want to consume that much sugar – but it sounds like an interesting idea. I’ve made my own vanilla extract with vodka, bourbon, rum and brandy. So far I like the bourbon best, but vodka is a nice, bland liquor to extract into. My least favorite was the rum. No matter what I used it in, I could taste the rum! Good for some applications, not for others. I picked up some Knob Creek yesterday and took about 8 vanilla beans and started my batch. I’m very excited to try this. I agree that it will make wonderful holiday gifts. Thank you, Wardee! Hi Wardee~ This looks fabulous! I’ve got my vanilla beans and bourbon all ready to go – but have a quick question … I ordered waaaay too many vanilla beans — how do you suggest I store them for future use? Thanks so much! Now I want to try vodka vanilla and bourbon vanilla and compare! Wardee, this is amazing! I’ve been trying to figure out an inexpensive way to replace ours when it runs out, but haven’t been too impressed with homemade vodka based ones. Bourbon is a fantastic idea! Thank you so much for sharing this! I am so excited to try this! I have my beans on order and am wondering what kind of Bourbon to use. Does anyone have a favorite brand? I am also wondering, with trying to use as many organic things as possible, what do you know about the purity or quality of the alcohol you are using? I am so blessed to benefit from all of your experiences! Thanks to everyone sharing! I just started a batch of vanilla extract with vodka in May and it keeps getting yummier and yummier as the weeks go by! We have to be gluten free, but regardless of what kind of grain it is made from it is gluten free because it is distilled. Beer is brewed and not safe, but liquors are safe. I’ve been thinking about making it into Christmas gifts too. Nice gifts and money spent now and not in the month of December! I have heard that a vanilla bean will last a LONG time…that you can actually use it over and over again to make new extract. Someone told me this but I can’t remember who! Has anyone done any research on the longevity of the beans? Also…last year around the holidays I saw whole vanilla beans at Costco next to the spices. I’m regret not purchasing a bottle then but I will keep a lookout for them this year. I was looking at my grocery store yesterday for bourbon and vodka, I was thinking of making two different kinds and see how they turn out. Everything I found at the store said it was diluted and 42 proof. I really don’t know anything about liquor, but my husband got online and found a few blogs that said you have to use at least 75 to 80 proof. which means I would have to go to a liquor store ( not crazy about that idea ) has that been your experience Wardee? if you used a less proof for the grocery store and had a good experience then I would try it as well and save myself the headache and high price of a liquor store. Katie — I just made more vanilla yesterday after buying more bourbon. At the liquor store, all their bourbon was between 80 and 90 proof (40% to 45% alcohol). I have been meaning to find a good recipe for homemade vanilla! Thanks so much for posting this. It’s perfect. Can’t wait to try it! Carol, I think that would be fine. Up there, someone else commented that she doesn’t scrape the seeds out and then the vanilla bean paste can be used later in dishes. It is a good idea, and I’m going to stop scraping mine now, too. i’ve been using vodka and doing this for about a year. i’ll never buy vanilla again! Hey, everyone! I’m adding a comment because *sheepishly* my math was off when I typed up this recipe. 1/2 gallon of bourbon actually needs 32 vanilla beans — or 4 per cup. So sorry! If you’ve got a half gallon brewing, just add 16 more vanilla beans (the original amount I mentioned was 16) to make it up to 32 vanilla beans. I saw a comment about storing beans in the freezer… and this vanilla bean site says absolutely not in the freezer– store in a cool dry place. They also say that they can keep for a year this way. Q: How should I store my gourmet vanilla beans? A: Vanilla beans should be stored in a closed, but not air-tight, container in a cool, dry, relatively dark place. Do not store vanilla beans in the refrigerator or freezer! (The cold will dry them out and may promote a particular type of vanilla mold.) The important thing is that the temperature be relatively constant and that air circulate a bit (unless they are vacuum packed, in which case you can keep them that way until use). If you do store them in an air tight, sealed container, we recommend opening it every couple of weeks or so to let the air circulate a bit. Thank you, Melanie! I hope mine aren’t ruined. 🙁 Thanks for taking the time to update this post with your knowledge. Does this bourbon vanilla ever smell and taste more like vanilla and less like strong alcohol? I’ve used very strong (90%) bourbon and it still is just hard alcohol. Or will it be vanilla alcohol? Tara — I just smelled mine today. I still smell hard alcohol, but when comparing to a backup bottle of bourbon, the vanilla scent is clearly there. Great post, Wardee! Thanks! Too bad I’m just now finding it so close to the holidays. I guess that I’ll have some really great-tasting vanilla next year! I can’t wait to get started. Hi Wardee, I was just reading another blog (Cheeseslave) about making homemade vanilla extract and a few people said that the brand “Makers” bourbon was GMO free. I haven’t had a chance to see if they carry this brand in California yet (I know nothing about alcohol) but as soon as I get to town I am going to do some checking. Thank you soooo much for posting this information. You have been a real help in my Kitchen. I love your cooking classes!!!! I saw this post as I was researching this last night for our late-night vanilla making party. Part of the rules of bourbon whiskey is that it needs to be at least 80 proof. From culling different sites I determined that the longer it sits, the more vanilla-y it gets and, it get extra strong with a higher proof alcohol. Last night we filled a dozen woozy bottles with 2-3 split beans. Will report back in 3-4 months with the results. Easiest recipe I found was buy a fifth of bourbon, take out two shots worth, add 8-12 split vanilla beans, and let sit in the dark for 3+ months, but shake bottle weekly. The reason we went with smaller bottles was I had them on hand and had so many different bourbons in my bunker that i wanted to ind the best one. QUESTION: This is my FIRST TIME making vanilla. I have used Absolute vodka and put 8 vanilla beans per cup. (I started with 6 beans per cup. After 5 months it didn’t seem strong enough so I added 2 more beans per cup, 3 months ago.) It has been curing for a total of 8 months and is VERY strong. I tried it in baking and it had a very strong taste. Last month I started a 2nd batch and I was thinking of mixing 4oz from the 1st batch with 4oz from the 2nd batch to dilute it. I prefer not to use a sugar syrup if I can help it. Any feedback or thoughts on how to make my first batch of vanilla less potent would be greatly appreciated. Couldn’t you just use less in your recipes? Wardee, I’m confused as to how you keep a batch going continually. How often do you add new alcohol? And doesn’t that dilute it so that it needs to sit for a while longer before using it again? It seems that would make it hard to maintain a consistent vanilla flavor. Kim — Actually that bothered me as well (the possible dilution) so what I ended up doing was purchasing another 1/2 gallon of bourbon and starting more aging. So one 1/2 gallon is always aging while I use up the one that’s ready to go. It’s probably so good because it is non GMO! 🙂 I went ahead and bought some tonight to start my vanilla tomorrow! Wardee – can you recommend a particular brand of bourbon that you have tried yourself? I make & sell vanilla extract. Vanilla extract reaches maximum flavor in two years, I don’t sell before then. It does not get any more flavor after two years. It can be fed; after taking some of the extract out add more liquor & a few more beans. I use 200 beans per gallon making it two fold. 144 beans per gallon for FDA rules, if sold. FDA standards require vanilla extract must contain 13.35 ounces of vanilla beans per gallon during extraction and 35 percent alcohol. The Federal Food and Drug Administration has specific regulations in the United States regarding commercial extract manufacturing, there are variables that create significant differences in extract flavor and quality. For instance, the FDA requires a minimum of 13.35 ounces of vanilla beans to a gallon of a minimum of 35% alcohol to 65% water mixture. There are no regulations on the quality of the beans, so beans can range from premium-quality to the driest cuts and splits containing only small amounts of natural vanillin. Although 35% is the standard alcohol requirement, premium vanilla extracts often contain a higher percentage of alcohol in order to extract more flavor from the beans. More alcohol is okay with the FDA; less than 35% is not. Double strength vanilla extract is made from 200 beans per gallon of alcohol, as opposed to the single strength vanilla extract, made from 100 beans per gallon (triple strength vanilla extract is made from 300 beans per gallon). It is a strength indicator, not a quality indicator. Thus, half (or a third, for 3x) of the amount is needed in the recipe. The product is used largely by culinary professionals who want to achieve specific results. For example, if making a white cake or frosting, the goal is to use as little extract by volume as possible, in order to preserve the pure white color. Using half as much vanilla extract enables this. Others use 2x and 3x vanilla to achieve a stronger vanilla taste. Twofold vanilla means that one only needs half the amount that the recipes calls for. I am very curious about the laws and regulations on making and selling vanilla extract. I have been pondering doing this on a small local scale for some time now, but have found next to nothing for information on regulations for doing this. I would Love to have a conversation with you about this sometime. I’m not sure is someone else already mentioned this, but it looks like Four Roses and Wild Turkey are two non GMO brands of bourbon. FYI bourbon vanilla is name of the type of vanilla bean, not that bourbon was used to make the extract. Though I am sure a vanilla extract using bourbon as the solvent is very good. Just a quick remark which I see Jack already mentioned… “Bourbon” is the common name of all vanilla beans grown in Madagascar. It has nothing to do with “bourbon” the type of whiskey. I generally use vodka but a smooth bourbon or rum makes a great tasting vanilla also! And currently I have several different varieties of beans aging, all in vodka. I made my first batch of vanilla last fall and gave some as gifts to my daughters, d-n-l, and great niece…it was the best vanilla I’ve ever used! I made mine with vodka, but will try the bourbon next time, but yes, there is no comparison to the added flavor it gives…to everything!! Do you know which type of vanilla bean is best? I have both Tahitian and Madagascar. As was mentioned above, the Bourbon referred to in Bourbon Vanilla is the name of the island that the vanilla is grown on.The island is now called Madagascar. Vanilla is generally made with vodka, which is flavorless, so that the full facets of the vanilla can be appreciated. I would think bourbon would distract from the taste of the vanilla, but it might make the bourbon better! In which case I’d use a cheap bourbon, and not mess with the taste of the finer brands. Though bourbon-the beverage, can be used as the alcohol component, there are others that can be used. The name comes from the plant. I used to live in KY where they would make bourbon ball candy, I couldn’t even stand the scent of those, they made me wheeze(asthma). It may be too late to save some people… BUT. “Bourbon Vanilla” has absolutely nothing, I repeat Nothing to do with the American alcohol / whiskey known as ‘Bourbon’. Total myth perpetuated by people who don’t fact check. The name comes from back in the 1700’s when the best vanilla beans came from Île Bourbon in the Indian ocean. Île Bourbon was owned by the French Royal family “House of Bourbon” and they sold their vanilla as “Bourbon Vanilla” to let everyone know of the quality. It was their BRAND. Now it’s just a shorthand way of denoting Quality. Anyone who makes vanilla extract with Bourbon whiskey is going to be disappointed because all you will taste is… whiskey. I will like to know a reputable place to buy vainilla bean in bulk. Thank you in advance for the information. It is important to use Grade B beans in vanilla extract. They are dried out more which is better for making extracts (less water content).